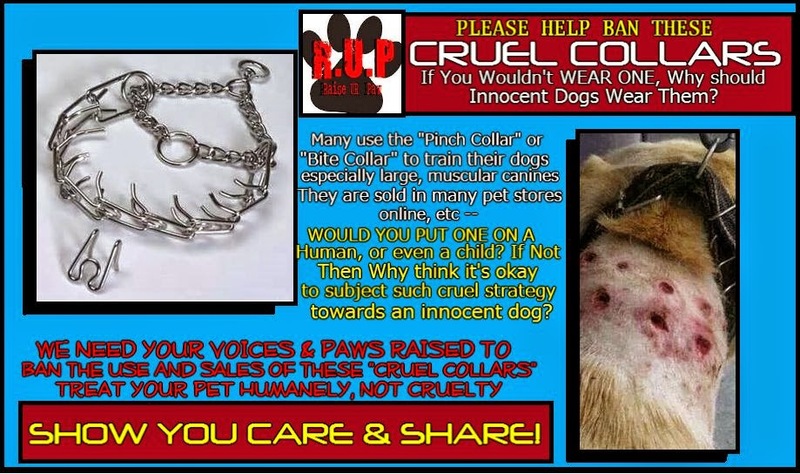 We at RAISE UR PAW are starting a campaign to have PRONG COLLARS (aka Pinch Collars or Bite Collars) banned from being used and sold online and pet related businesses. We are asking everyone worldwide to please take part in our efforts and show support by raising your voice and paw against these CRUEL COLLARS - which are often used large, muscular dogs as training tools. 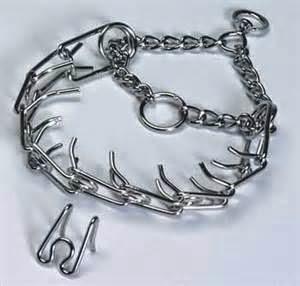 According to description given about these collars - they are two thirds made of wide links that each have two blunt prongs that face towards the dog. This group of links is attached at either end to a loop of chain with two rings equidistant apart -- apparently, if the leash is attached to both rings, the collar will not tighten -- BUT-- if the leash is hooked to only the first ring and then pulled, the collar tightens and the canine's skin on the neck will become pinched and therefore cause serious suffering and injury to the poor animal. Of course many experts state that these collars are more humane than the slip collar, but when it comes to such cruel collars as these, we must ask ourselves... Would be put these on other human beings, or children as training tools?? if you say NO, then why are we putting them on defenseless dogs - subjecting them to the treatment, do people actually believe that animals should be treated this way? It has also been reported that beyond the irritation to the skin due to the prongs of these collars, there are also extreme injuries that can occur as well. WE ARE ASKING ALL TO PLEASE RAISE UR PAW TODAY TO HAVE THESE CRUEL COLLARS BANNED, SO THAT INNOCENT LIFE WILL NOT BE SUBJECTED TO SUFFERING AND INJURIES - WE ALL HAVE VOICES LET'S USE THEM UNITED - BECAUSE ANIMALS DESERVE TO BE RESPECTED AND FOUGHT FOR.